BLFGT Sandwich replaces the vine ripe red tomatoes with the southern staple fried green tomatoes in this classic, simple sandwich! If you’re new to my blog, welcome! Nice to have ya here. Take a load off and sit a spell. Would you like some iced tea? I have some peach tea if you’d like. How about some pimento cheese? I make a darned delicious sandwich from those. Or would you like something classic with a twist? How about a ham and cheese that’s married with a cheesesteak? I also have a delicious overnight muffalatta sandwich. How’s that for classics with a twist? I have several sloppy joe recipes, too. I’m all about sandwiches. Simple sandwiches that are delicious and easy to prepare. I bet you’re saying, “But Christie, this is an oven baked fried green tomato! How can that be simple?” Because it is. You dredge, dip, and dredge again, then bake. It takes all of about 5 minutes to prepare all the tomatoes. The hardest part is waiting for them to bake in the oven. And to make it even super simple, I microwave my bacon. Or you could buy pre-cooked bacon, but I think it’s so easy to cook bacon that it’s a waste of money. I put several slices on a paper towel, cover with a paper towel, and then microwave for 4 minutes. Then I asses for crispiness, remove any that are already crispy, and cook at 1 minute intervals continuing to remove cooked strips until all the bacon is cooked. The grease stays strapped in the paper towel. You don’t have to heat up the kitchen and make a mess of your stove cooking bacon. The oven doesn’t have to be turned on if you cook yours in the oven. It doesn’t even make a mess of the microwave! The top paper towel catches all the “splatter” that would have occurred had you not topped your bacon. I have to tell you, I didn’t think of this sandwich all on my own. It’s recreate from a restaurant just south of me in Ruckersville called Jack’s Shop Kitchen. If you’re ever in Ruckersville, I HIGHLY recommend stopping there for bite. Their sandwiches are DELICIOUS! I had a fried green tomato sandwich there. It was delicious. However, I was truly hoping for that tart taste of the fried green tomatoes to come through. I mean, that’s the reason I eat them! For that tart flavor that’s like no other. I do have a slight obsession with fried green tomatoes. I’ve made them forever! I’ve made them in the oven, in the skillet, and in the toaster oven. Yes. I said toaster oven! In college I was dying for some fried green tomatoes, fried chicken, and mashed potatoes. So, I turned my toaster oven into a skillet, my rice cooker into a boiling pot, and well, we store bought the chicken I think. But, it was a perfectly delicious southern meal right in my dorm room. Hell hath no fury like a kitchen hoor with a craving! I could eat a sandwich a day and never get bored. And it doesn’t even have to be a fancy sandwich like this one. A plan BLT, turkey and cheese, ham and swiss, beef and cheddar. Honestly, any sandwich will do. Shrimp salad, chicken salad, TUNA SALAD; ANY sandwich. Daily. I would not get bored. I used to take a sandwich for lunch every day before I met the hubs. It would sometimes be bologna, turkey, ham, but usually not roast beef. Sometimes it was tuna salad, but the hubs makes THE BEST tuna salad. I could eat his every lunch for years and not get bored. It’s full of delicious flavor and crunch. Sometimes, I would fry the bologna and have some American cheese to melt on top. Have you ever done that? Fried bologna? It’s so good. I think, next to fried green tomatoes, I grew up on fried bologna. It’s even good on a breakfast sandwich with a fried egg on top. Oh yeah. You have to try it!! It’s the best breakfast ‘wich ever! Oh, and when we were growing up, Dad would make us hot ham and cheese sandwiches. I still do those to this day. Basically, you take the ham and put it on a plate. Then you top it with cheese and microwave it for a minute or so until the ham is hot and the cheese is melted. Then you put it on bread or a bun that’s been spread with mayonnaise. Top it with tomatoes and you’ve got a simple, quick lunch in under 5 minutes. I love how I’m getting all nostalgic with these sandwiches. Then there’s the quintessential PBB sandwich. Wait what? You’ve never heard of a PBB sandwich? I think I literally grew up on peanut butter and banana sandwiches. It is the ultimate comfort food for me. Toasted, not toasted, grilled; peanut butter and banana is I think my most fave sandwich hands down! I could eat those for every meal and probably not get bored. But, I must say that I’m picky about the bananas. They can’t be too ripe. I don’t like them too sweet because the peanut butter has added sugar to it. I like my bananas to be just yellow. That has the texture I like and just the right amount of sweetness. Now if it’s for a smoothie, then it must be as green as can be. Did you know that the greener the banana is the more fiber it has? The more yellow it is the more sugar it has? That’s why green bananas for a smoothie. You see how my brain works? These sandwiches were so good. They had delicious crunch from the panko. The green tomatoes came to the plate with that tangy flavor I was expecting to taste. Then there was the smoky, salt, and delicious bacon. I’m drooling. You drooling? I put them on a bun, because I wasn’t thrilled with the bread options when I hit the store. These should totally serve this on an artisan, thick sliced bread. OR that English muffin toasting bread I grabbed the other week. I didn’t see that when I put these on the menu. And yes, you’re totally correct! Part of this recipe comes from the fish sliders I made. The dredging liquid has a slight tempura type quality to it and really adds delicious beer batter flavor to these tomatoes. You can’t totally use water if you’d prefer. Have you made fried green tomatoes before? Dredge the tomatoes in the flour, then dip into the batter, and then coat with panko before placing on a baking sheet fitted with a rack. Spray the tomatoes with cooking spray (or use an oil mister). Place the baking rack in the upper third of your oven and bake the tomatoes for 7 minutes. Turn the tomatoes over, spray again, and bake an additional 5 to 7 minutes depending on the thickness of your tomatoes. While the tomatoes are cooking, prepare your bread or buns. Spread the mayonnaise on the bread, top with one or two leaves of lettuce, and 2 slices of bacon. Once the tomatoes are cooked, allow to cool slightly before placing two slices on top of the bacon (or place the bacon on top of the tomatoes. It’s your sandwich) and serve with chips and a pickle. this sandwich look delicious !! I worked in a sandwich shop for many years and I’d bet this would have been a smashing hit! Thank you! Maybe someone will put it on their menu. I love fried green tomatoes with a drizzle of ranch dressing! I know I would LOVE this sandwich! And my dad loved fried bologna! Those edges so crispy because he liked to fry everything to death! Oh to have one more time to sit and eat that with him. I loved it on toast with yellow mustard. I am going to have to make on again soon! Thank you for the delicious recipe and bringing to mind a wonderful memory! You’re so welcome! Those are one of my fave sandwiches. Dad made the best ones. I think you know how I feel about fried green tomatoes! This is my kind of sandwich! So so delicious, aren’t they? Great sandwich Christie, thanks for sharing. You’re welcome! It’s great on the fish sliders, too. The beer adds a nice little hint in the background. 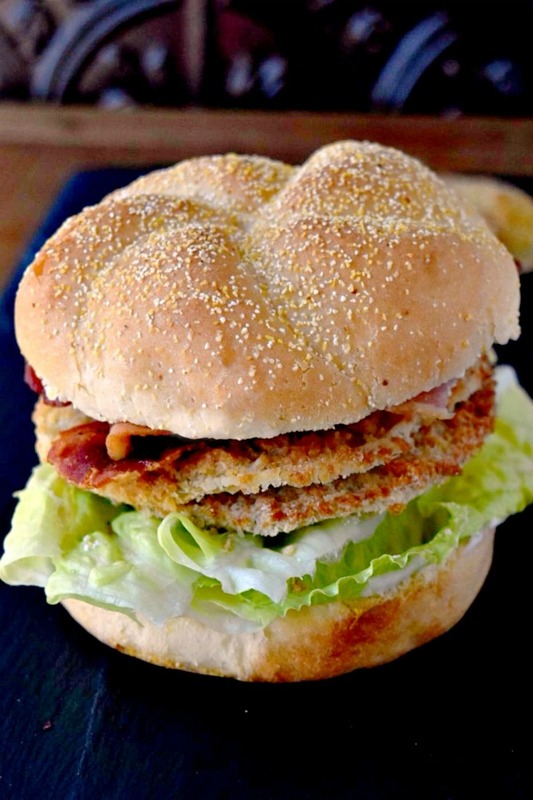 I would have never thought to make a sandwich with fried green tomatoes, but it’s such a fabulous idea!! It looks scrumptious!! Thank you, Liz! They’re pretty good. I love fried green tomatoes…will definitely be adding them to my next BLT. I hope you like them! I thought you’d get a kick out of the beer accent in the batter. 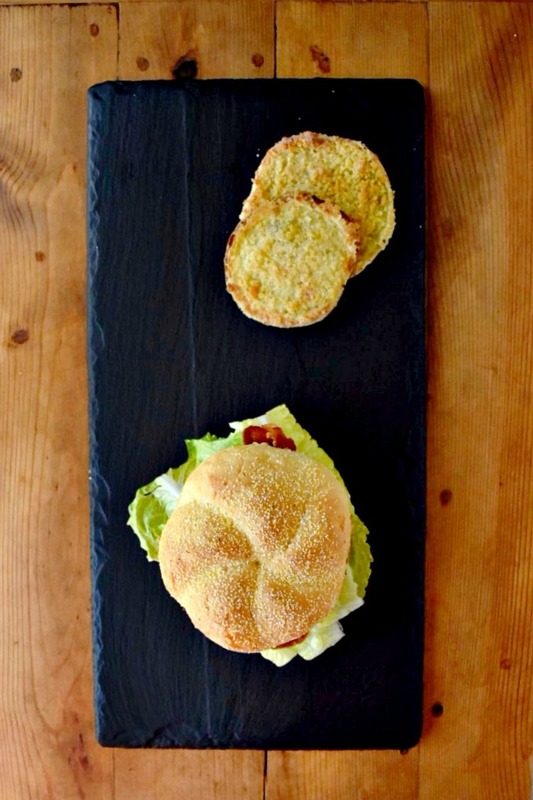 I’ve never had a fried green tomato sandwich but after seeing this I won’t rest until I have one, looks fabulous! They’re delicious! I hope you like them.